Although BOLD-fMRI is widely used for in-vivo functional brain mapping, there has been continuing interest in the possibility of using MRI to directly detect the neuronal activity. However, previous works failed to reach a clear consensus on that possibility. Here, we proposed a novel method for direct detection and spatial mapping of neuronal activity with temporal resolution on the order of the action-potential duration(4~5ms). We demonstrated its feasibility using an ex-vivo squid axon and an insulated copper-wire in an event-related electrical-stimulation paradigm. The results are very exciting and promising, although the underlying contrast mechanism needs to be elucidated. Using MR elastography, the shear modulus of a mouse brain was monitored during noxious stimulation. Localized changes in tissue elasticity of >10% were observed in previously identified regions associated with noxious stimuli. The observed mechanical response persists over two decades of stimulus frequencies from 0.1-10 Hz. This demonstrates the mechanism behind the change in stiffness is not of vascular origin, which has a much slower response than 10Hz. but rather is either directly related to, or tightly coupled to primary neuronal activity. This opens a new window to explore the spatio-temporal processing of signals in the brain. Cerebral MR elastography paired with arterial spin labelling was applied to a group of healthy male subjects during a hypercapnia challenge to analyze the interrelation between cerebral blood flow and mechanical properties of brain tissue in vivo. Hypercapnia-induced vasodilation and the associated increase in blood perfusion was accompanied by a highly significant increase in global cerebral stiffness by 3% (p<0.0001). A golden angle radial encoding (GARE) method was implemented to map BOLD signal from individual venules penetrating the rat somatosensory cortex with 50 μm spatial resolution. This real-time acquisition method makes it possible to detect the hemodynamic signal from individual vessel with much finer spatial scale than previously reported methods. It also provides high flexibility to define the field of view to only focus on the activated brain regions and increase the sampling rate for fMRI imaging. This GARE method improves the existing single vessel fMRI method with higher spatiotemporal resolution. Using dynamic multiecho 3D 23Na MRI with a temporal resolution of 25s, we demonstrated that functional 23Na MRI at 7T was sensitive enough to observe non-invasively in the Human brain, sodium signal variations during a conventional hand motor task. This acquisition performed at 3 different TEs showed that the closest spatial pattern of sodium signal changes relative to BOLD activation was the decrease of 23Na signal at long TE (19ms) assuming to mostly reflect the extracellular sodium changes. This work opens a new ear to better understand normal and abnormal activity-dependent metabolic coupling in the neuro-glia-vasculature ensemble. High spatial resolution is essential for blood oxygenation level dependent fMRI of laminar or columnar structures and a voxel size of 0.5 mm would be desirable. With common 2D EPI acquisitions this leads to prohibitively long readout trains, echo times and high in-plane distortions. We therefore propose a 3D POP EPI with minimal in-plane distortion and an echo time dependent on the number of slices that can achieve 0.5 mm isotropic resolution. We further investigate analysis methods based on classical and Bayesian statistical inference for this high-resolution data and show the gained sensitivity when using the Bayesian inference scheme. Cortical layer-dependent fMRI opens new possibilities for studying neuronal circuitry. Gradient-echo BOLD contrast, which is commonly used for fMRI, suffers from decreased spatial specificity due to BOLD contrast arising in large draining veins. Vascular space occupancy (VASO) and gradient and spin echo (GRASE) acquisition techniques were shown to improve spatial specificity. Here, the technique to acquire BOLD-corrected GRASE-VASO images and its application to fMRI in human motor cortex at 7T are presented. The results suggest increased spatial specificity as compared to EPI-VASO, which could be beneficial for layer-dependent fMRI applications. Velocity selective (VS) ASL theoretically allows high temporal resolution functional CBF mapping, since the arterial tag is immediately delivered to target microvascultature. This is in contrast to conventional ASL, which suffers from transit delays that limit minimum TR to about one second. VSASL, however, employs a nonselective VS tagging scheme, resulting in incomplete T1 recovery of tagged blood away from the imaging slice, and subsequent signal loss at low TRs. 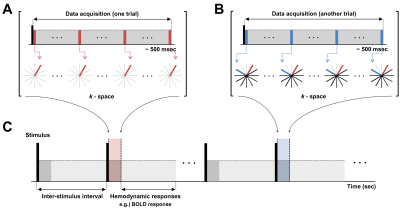 In this study, we introduce a slice-selective VS tag to mitigate T1 recovery effects, and for the first time demonstrate subsecond functional CBF mapping of the visual cortex. The approach is dubbed “Turbo VSASL”. 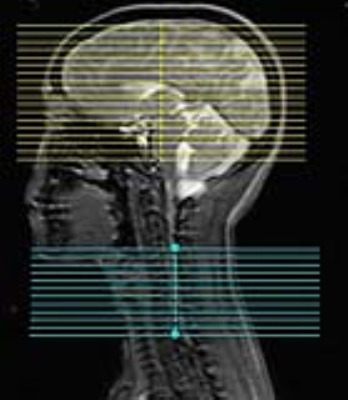 Although the potential of bSSFP for fMRI has been previously demonstrated, the use of bSSFP remains limited at high field due to the presence of banding artefacts. 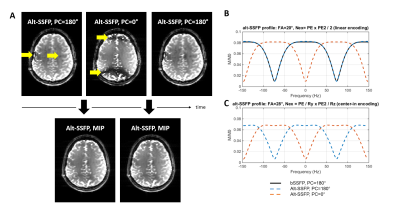 We demonstrate here that a modified bSSFP sequence with alternating phase cycles (0/180°) can provide distortion-free and band-free fMRI images at 7 Tesla with a wide coverage (72 mm), and temporal / spatial resolution that match that of conventional EPI (2 mm isotropic, TRvolume=1.7 s), by combining water-selective spectro-spatial pulses and very high undersampling (12-fold) coupled with controlled aliasing (CAIPIRINHA). 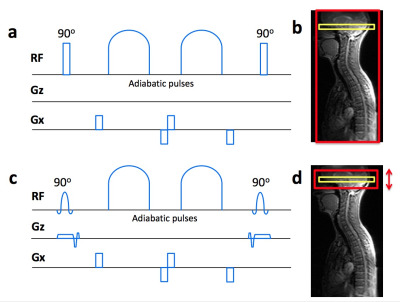 We investigate resting-state brain and spinal cord functional connectivity of four healthy volunteers by means of a novel dynamic per slice shimming approach. Functional connectivity, between brain and spinal cord, reveals localization to corresponding sensory and motor areas. Our results are consistent with task-based brain-spinal cord activation results using a motor task , suggesting a strong connection of descending and ascending signals with the brain.